Those volcanic eruptions that seem so scary and apocalyptic might have actually slowed the global warming rate by up to 50 percent. Climate change, global warming, whatever you want to call it, it's the kind of thing that's concerned a great many scientists in recent years. But over the past decade, researchers noticed something odd about it: Even as the pollutants in the atmosphere continued to rise, the warming seemed to be slowing down. There are a variety of possibilities for why this is, but a recent study from the Massachusetts Institute of Technology has put forward a new theory: Volcanoes could be cutting the rate of global warming in half. 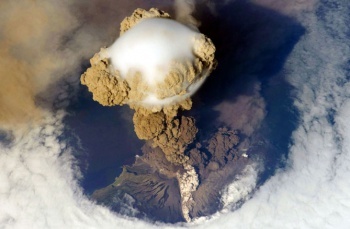 Even though we think of volcanoes as centers of hot firey magma, they also belch out insane amounts of ash and smoke. Instead of making global warming worse however, it could have mitigated the increase of greenhouse gases by reflecting sunlight back into space that would otherwise heat the planet, similar to nuclear winter theories. Balloon, laser radar, and ground-based measurements were used over the course of the study, which concluded that volcanic eruptions are responsible for significant cooling effects since the year 2000. Now that's not to say the climate change issue is solved - the surface temperature is still rising after all - but if true, it would slow the rate enough to partially explain the pause we've experienced. If anything, it's a temporary fix that lets us catch our breath before finding a more lasting solution.